In this report, we analyze transparency data released by the Centers for Medicare and Medicaid Services (CMS) to examine claims denials and appeals among issuers offering individual market coverage on healthcare.gov from 2015-2017. We find that, across issuers with complete data, 19% of in-network claims were denied by issuers in 2017, with denial rates for specific issuers varying significantly around this average, from less than 1% to more than 40%. We also find that consumers rarely appeal claims denials to their issuers, and when they do, issuers typically uphold their original decision. Healthcare.gov consumers appealed less than one-half of one percent of denied claims, and issuers overturned 14% of appealed denials. Transparency data can provide information about health plan coverage and operations that might not otherwise be readily apparent. For example, they can reveal how often issuers deny claims or pay claims promptly. Transparency data can also shed light on the adequacy of health plan networks, for example, showing how often enrollees seek out-of-network care. Data can form the basis for report cards or other tools to help consumers understand and compare health plan options, and can inform oversight activities, such as plan certification and market conduct examinations. The data posted by CMS has significant limitations, some of which may be partially addressed in future collections. The large range in claim denial rates across issuers raise questions about the quality of the data. The current release does not provide information about why a claim was denied, making it difficult to assess what is driving the denials and why they vary so much. CMS also is not collecting data for several categories specified in the Affordable Care Act (ACA), including the number of out-of-network claims submitted and denied and consumer financial liability for out-of-network claims. In addition, while the law requires reporting by most employer-sponsored group health plans and other individual market plans, CMS is currently only collecting information from issuers offering individual plans through the Federal Marketplace. The law requires these data to be available to state insurance regulators and to the public. In 2016, the Centers for Medicare and Medicaid Services (CMS) began collecting ACA transparency data for non-group issuers of qualified health plans (QHPs) – both major medical and stand-alone dental plans (SADPs) – sold through healthcare.gov. Currently, public use files for three calendar years – 2017, 2016, and 2015 – are aggregated at the issuer level and available online. We analyzed these public files, with a particular focus on major medical plans. We excluded issuers that primarily offered stand-alone dental coverage and companies with incomplete data. The working files for this analysis are posted to the report page and the methods section below details our rules for inclusion. There are limitations to the publicly-posted data. For example, the transparency data do not include reasons for claims denials. Issuers use standardized reason codes for claims adjustments and denials; without this information, one cannot distinguish claims denied for reasons of medical necessity, for example, from those denied due to an incorrect or incomplete submission. Transparency data also do not include other detail that could shed light on the nature of claims submitted and denied – for example, reporting on the types of services or dollar amounts involved. Additionally, reporting differences may be the result of issuers interpreting instructions differently, particularly around how to report partially approved claims or duplicate claims denied. The accuracy of data reporting may be another limitation; CMS does not conduct data verification of the transparency data. ACA transparency data reveal new information not previously available to the public about the number of in-network claims submitted in healthcare.gov plans, the number of in-network claims denied, the number of denied claims that are appealed, and the outcome of appeals.3 This provides a glimpse into plan performance that may be of interest to consumers and regulators. Of the 180 major medical issuers in healthcare.gov states included in the transparency data, 130 show complete data on in-network claims received and denied for the 2017 plan year. Together these issuers reported 229.8 million in-network claims received, of which 42.9 million were denied, for an average in-network claims denial rate of 19% (Figure 1). In these data, issuers report all denials including denials due to ineligibility, denials due to incorrect submission or billing, duplicate claims, and denials based on medical necessity. 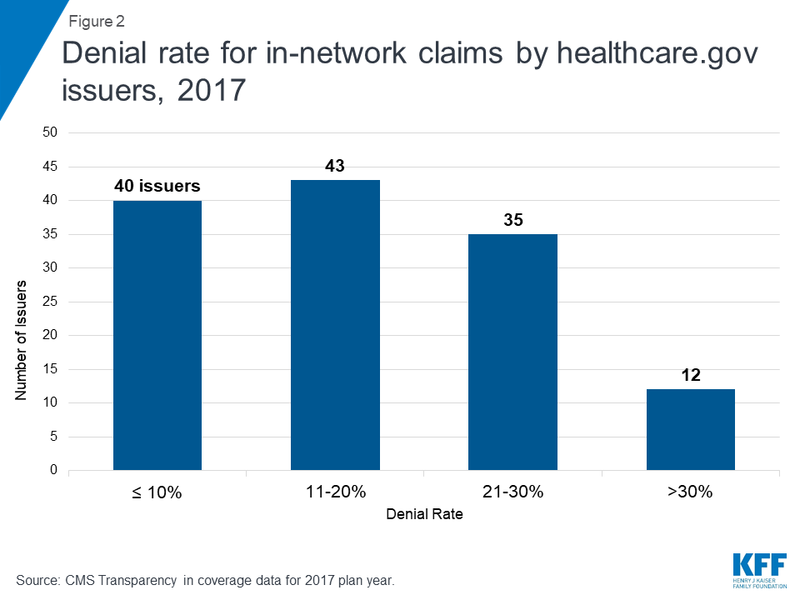 ACA transparency data show denial rates by issuers were highly variable, ranging from 1% to 45% of in-network claims. Overall for 2017, 40 of the 130 reporting Healthcare.gov major medical issuers had a denial rate for in-network claims of 10% or lower. Another 43 reporting issuers denied between 11 and 20% of in-network claims that year, while 47 issuers denied more than 20% of in-network claims this year (Figure 2). Denial rates also vary from state to state (Figure 3). However, in states where multiple issuers participate in the marketplace, the average denial rate can obscure variation among issuers. For example, in Florida, where six marketplace issuers together denied 11% of more than 40 million in-network claims submitted in 2017, denial rates of the six issuers ranged from 2% to 32%. Depending on the nature of the denial, consumers may or may not be held harmless. If held harmless, a consumer may never realize a claim had been denied, but if not, she could face significant financial liability. Notes: States are shown in gray if they are state-based exchanges or if 60% or more of the enrollment in that state is missing from this analysis (either because issuers are missing from the CMS transparency data or because issuers have missing or invalid data). Each issuer shown on the map represents a unique HIOS ID and issuers have not been aggregated up to their parent companies. Determinations of whether issuers are missing from the transparency data are based on HIOS IDs, not issuer names. On average, issuers reported similar denial rates in earlier years. 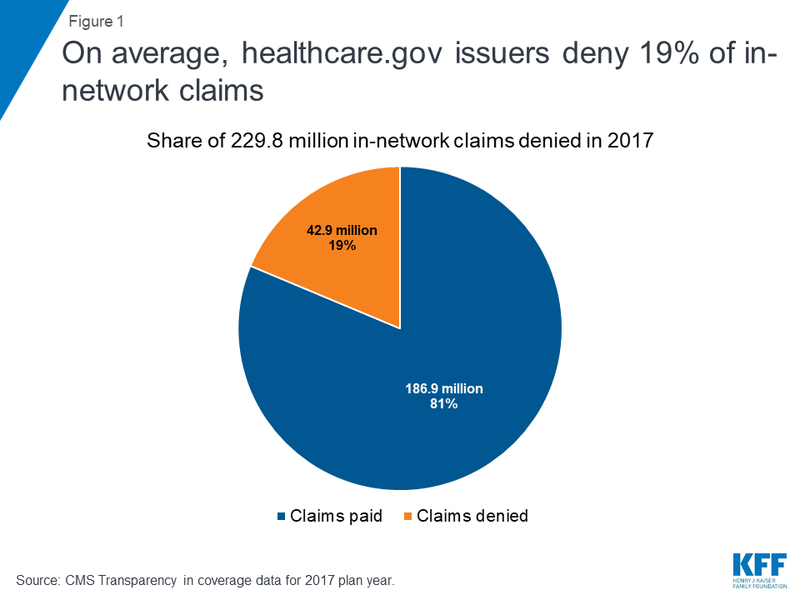 For the 2016 plan year, healthcare.gov issuers denied 17% of in-network claims, with denial rates of issuers ranging from less than 1% to more than 65%. For the 2015 plan year, the average denial rate was 19%, with denial rates ranging from less than 1% to more than 90%. The claims denial rate was relatively consistent over time for some issuers, while for others it was more variable. For example, Molina Healthcare of Florida reports denying 32% of in-network claims submitted in 2017, 30% in 2016, and 22% in 2015. Meanwhile, Blue Cross Blue Shield of South Carolina reports denying 30% in 2017, 16% in 2016, and 15% in 2015. UPMC Health Plan of Pennsylvania reports denying 4% in 2017, 2016, and 2015. However, Security Health Plan of Wisconsin reports denying 7% of in-network claims in 2017, 8% in 2016, and 35% in 2015. For the 98 issuers of standalone dental plans in healthcare.gov states that show data on in-network claims submitted and denied in 2017, claims totaled 2.9 million, of which 712,671 (25%) were denied. Nine of the SADP issuers reported denial rates of 10% or less for in-network claims, while 36 issuers reported denial rates of 30% or higher. The ACA transparency data show the number of denied claims that were appealed to the plan (internal appeals), the number of internally appealed denials that were overturned by the issuer, the number of external appeals made by consumers, and the number of externally appealed denials that were overturned. The CMS public use files suppress values lower than 10. Consumers rarely appeal denied claims. In 2017, 121 major medical issuers show data values on submitted, denied, and appealed in-network claims. Together they denied more than 42 million claims, of which consumers appealed fewer than 200,000 – an appeal rate of less than one-half of one percent (Figure 4). Transparency data for 2015 and 2016 show even lower appeal rates by consumers, 0.1% and 0.2%, respectively. Issuers uphold the vast majority of denials that are appealed. In 2017, 14% of denials that enrollees appealed internally to their health plans were overturned. The overturn rate of appealed claims denials also varies. Among 118 issuers whose appeals outcomes data were not suppressed, the overturn rate ranged from 1 percent to 88 percent. The ACA guarantees external appeal rights to enrollees in all non-grandfathered private health plans. When issuers uphold denials at the internal appeal level, consumers have the option of requesting an independent review by an outside entity, whose decision is binding. Consumers also can bypass internal appeal and go directly to external review in emergencies and certain other circumstances. Consumers seldom avail themselves of external review. Of the 130 issuers that reported data on external appeals requested in 2017, 84 had data suppressed because the number of external appeals filed was less than 10. Even if a value of 9 were assumed for each of the suppressed data fields, fewer than 1 in 11,000 denied claims made it to external review. Issuers also report data on the disposition of external reviews, though number values for the vast majority have been suppressed. For 2017, 18 issuers display number values for both the number of external appeals filed and the number of denials overturned at external review. For 112 other issuers, either the number of external appeals filed, or the number overturned, or both, was smaller than 10, and thus suppressed. Given these limitations, the data do not support a finding about the percent of denials overturned at external review. Absent data on how often other commercial health issuers deny claims, it is difficult to put ACA transparency data in context. The federal government does not yet require ACA transparency data reporting by other insurance issuers or group health plans. In its most recent data collection notice, CMS says it will work with the U.S. Department of Labor and State-based Exchanges to extend transparency data reporting on a phased-in basis after the 2021 collection year. State insurance regulators collect data on denied claims, appeals, and other metrics from all licensed health issuers in the U.S. under the Market Conduct Annual Statement (MCAS) system, administered by the National Association of Insurance Commissioners. The MCAS health data collection began in 2018 for the 2017 plan year. Data are reported at the plan metal level (i.e., bronze, silver, gold, and platinum) for plans in the individual and small group market, on- and off-exchange. Additional reporting metrics will be added for the 2018 plan year, including reason categories for claims denials, and separate reporting on prior authorizations required for behavioral health and substance use services. MCAS data are collected to inform oversight and market conduct activities and, to date, have not been released to the public. One state-based marketplace – CoveredCA – requires issuers to report data on in-network claims submitted and denied each year. Data are reported at the issuer level and are posted on the marketplace website. For the 2017 plan year, 10 issuers reported receiving 33 million in-network claims, of which 8 million were denied (24%). The denial rate for individual issuers ranged from 7% to 41% that year. For 2016, 10 issuers reported receiving 24 million claims of which 4 million were denied (18%). Denial rates for issuers ranged from 4% to 33% that year. These metrics and trends are roughly similar to those seen in the ACA transparency data for healthcare.gov issuers. CoveredCA does not post data on appeals. Connecticut publishes an annual consumer report card on health insurance carriers. The 2017 report card includes information about 4 HMOs and 8 health issuers that together cover 2.2 million state residents; about 83% of enrollment is from large group plans, 11% from small group plans, and about 6% from individual market plans. The Connecticut report card includes data on all claims submitted and denied, as well as major reasons for claims denials. Data are aggregated and shown at the issuer level. A recent report by the Inspector General (IG) of the US Department of Health and Human Services examined claims denial rates and appeals in Medicare Advantage plans (ACA transparency data requirements do not apply to the Medicare program). The IG found that, on average, 8% of claims and prior authorizations (combined) submitted to Medicare Advantage plans over a 3-year period (2014-2016) were denied by issuers – less than half the denial rate reported, on average, by healthcare.gov issuers. In addition, the report found that 1% of denied claims were appealed by consumers, and 75% of appeals resulted in overturn of the denial. The IG report also described a 2015 CMS audit of claims denials by Medicare Advantage plans that cited 56% of audited contracts for making inappropriate denials. Transparency data provide no information about how claims denials affect patients, though other research sheds some light. A 2000 survey by the Kaiser Family Foundation of consumer experiences with private health insurance found that most consumers (51%) experienced some problem with their coverage. About half of problems related to billing and paperwork issues, while about one-third related to care, and the impact on consumers was often substantial. Almost four in ten consumers (38%) said problems meant they had to pay more for treatment or services. Usually (51%), the financial consequence to the consumer was less than $200, though for some (14%) it was $1,000 or more. Insurance problems were also time consuming; about one-in-five said they lost time from work or school. And they were aggravating; 58% said the experience was as or more stressful than doing their taxes. Most consumers (88%) took some action to try to resolve problems, most often (77%) by contacting their health plan or provider. Only 6% filed formal appeals. Most consumers (51%) said they either could not resolve the problem to their satisfaction or were still trying. Finally, most people who experienced problems with their health plan (52%) nonetheless gave their plan a satisfaction rating of A or B, though a larger share of consumers who had not experienced any problems (72%) gave their plan an A or B rating. The initial collection and release of ACA transparency data offers a glimpse of what can be known about how health plans work in practice, though limitations raise questions about how to interpret data, what may underlie the results, and how regulators might use transparency data. The variation in claims denial rates across issuers is striking. Both industry and regulatory experts we spoke to suggested that at least some of the variation is likely due to inconsistencies in how issuers understand reporting instructions,7 what they report, and the accuracy of reporting. For example, issuers may vary in how they report partial claims denials or denials of duplicate claims. Clearer reporting instructions, additional training, and greater use of data verification and validation measures could improve accuracy and consistency of reporting. Experts also suggested that at least some of the variation in claims denial rates reflects true differences across issuers, and could be better understood if reported in more detail. Differences in the composition of health plan provider networks – for example, networks that are more or less tightly managed, or that include providers who are more or less adept at submitting claims correctly – could underlie some of the variation. CMS announced in a transparency data collection notice that it will require reporting of plan level (versus issuer level) claims data beginning with the 2019 collection year. Reporting on the reasons for claims denials and other detail about the nature of claims submitted and denied also could inform the transparency data. CMS will require healthcare.gov issuers to report six denial reason categories beginning with the 2019 data collection. The CMS notice specified these categories: (1) referral or prior authorization required, (2) out-of-network, (3) services excluded or not covered, (4) not medically necessary, excluding behavioral health, (5) not medically necessary, behavioral health, and (6) all other. Reporting on additional metrics could also inform transparency data. Issuers already report data on some additional metrics under other programs. For example, issuers currently submit data on out-of-network claims to state insurance regulators through MCAS, but these data are not yet reported to CMS. Issuers also report on timeliness of claims processing on the MCAS, but not to CMS. In addition, marketplace issuers currently do not report ACA transparency data on pre-authorizations required or denied under marketplace plans, though all licensed issuers do report such information to state regulators through MCAS. Medicare Advantage plans also report separately on claims and prior-authorizations. For other additional metrics, data reporting is not yet established, and could entail new costs and effort. Some metrics are already specified in federal law, others could fall under the broad authority of the Secretary of Health and Human Services to require reporting on “other information deemed appropriate.” For example, the ACA specifies transparency data reporting on cost sharing and payments with respect to out-of-network claims. Such data could yield important information about the adequacy of a plan’s provider network; depending on the level of detail required, it could also inform consumers and regulators about the incidence of “surprise” medical bills.8 The effect on patients of claims payment practices and denials is not yet captured in the ACA transparency data. Issuer statements, also called explanation-of-benefits (EOBs), typically do show the patient liability for claims paid, partially paid, or denied, though reporting of this information is not required to date. 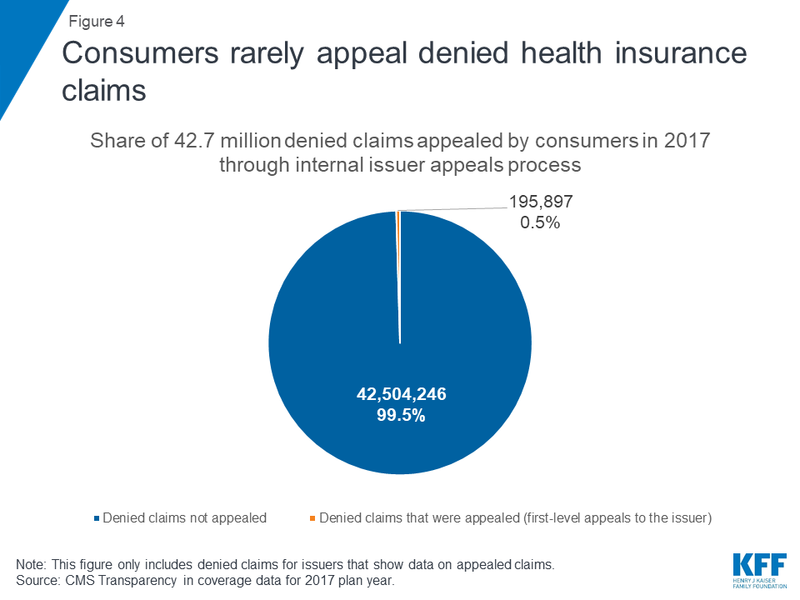 The data show that consumers rarely appeal denied health insurance claims, although appeals data are also very limited. For example, data do not show appeals by type of service, or dollar value involved, or based on the reason for the denial. Data on external appeals also do not indicate differences in the type of appeals process applied. Under federal rules, issuers in certain states are subject to a federal appeals process for external review that limits the scope of denials that are eligible for external review and that permits the issuer to determine, on a case-by-case basis, whether to use an external review organization hired by the issuer or by the federal government.9 Data also do not show why the appeals rate is so low. Reasons could include the validity of initial denials, or the inability of patients – especially when sick – to pursue appeals, or deficiencies in consumer notices. For example, a 2015 CMS report on Medicare Advantage plans “cited 45% of contracts for sending denial letters with incomplete or incorrect information, which may have inhibited beneficiaries’ and providers’ ability to file a successful appeal.”10 The ACA established state Consumer Assistance Programs (CAPs), whose duties include helping consumers file appeals for denied claims, and reporting data to the Secretary on consumer experiences with health insurance. Issuers and group health plans are also required to notify consumers about CAPs in their state and include contact information about programs on all written claims denial notices. The CAPs were established in most states in 2010, but Congress has not appropriated funding for the programs since then. Finally, it remains to be seen how regulators will use transparency data reported by issuers. The stated purpose of MCAS data is to inform oversight and market conduct activities of state regulators. The Inspector General’s report on Medicare Advantage plans finds claims denial rates concerning, “particularly because beneficiaries and providers rarely use the appeals process designed to ensure access to care and payment,” and recommends enhanced oversight by CMS. To date, CMS does not use ACA transparency data in oversight or marketplace plan certification, and its recent data collection notice states this will continue to be the case for another three years. However, in its 2020 proposed rule for marketplace plans, CMS said it will explore opportunities to expand the collection of transparency data in an effort to assist consumers in selecting a QHP offered through the marketplace.